Since 1994, the World Teacher’s Day has been celebrated on October 5 to honor the men and women who influenced our lives and taught us what we know. On her article, Marina Benipayo, a mom and a lecturer at the School of Fashion and Arts (SoFA), said that her unforgettable professor chose to be the villain to bring out the hero in her students. We may sometimes misunderstand our teachers, but at the end of the day, they will be there to support us. Recite a poem. The easiest thing that you can do to tell your teachers you appreciate them is through poems. You can either write a poem yourself or search online that best suits your teachers. Conduct a mini recital and deliver the poem as your teacher enters the room. If you can’t write a poem, how about spoken words? Take your teacher’s role. Some schools plan an event like this every World Teacher’s Day. The higher levels will take on the role of their teachers and will take turns in teaching the lower levels. If your school doesn’t have something like this, you can just let your teachers sit down every class and take turns in reporting the lessons in the class. This requires an advance reading of your lesson. This could bring not just a break for your teacher, but also your mastery of a certain topic – a goal that every teacher is aiming each day. Create a class scrapbook. Another way to tell your teachers you appreciate them is to create a class scrapbook. Try to take as much pictures as you can and make a collage out of them. Leave a space for sticky notes so everyone can add in a little message for their favorite teachers and put it up on the class bulletin board. Better yet, use a part of your bulletin board as the canvas for your class scrapbook. Do a video. Doing videos is a popular gift these days since it’s cheap and modern, at the same time shows a lot of effort. You can test your imagination on how you would record the video. 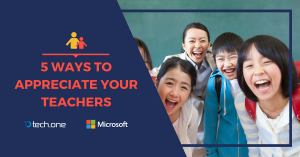 You can take a simple video like compiling your classmates’ messages for their favorite teachers or you can make your own movie depicting your favorite lesson or favorite moment in class. Make a small program. The length of the program will depend on how much time can be spent for it. It doesn’t have to be big, it just have to be organized. Talk to your principal if you want it to be a school-wide event, otherwise you can just work within the class. Be discreet in planning so you wouldn’t spoil the surprise. In planning, you can use an online application like Office 365 where you can share your ideas through file sharing and live-edit documents with the whole class. At the end of the day, it is not about how you do it, but it is the thought that counts. Teachers are our second parents and sometimes they know us more than we know ourselves. Teachers may show tough love, some can be our best friend. Whichever side they show to us, they are still a part of our lives and they helped us become what we are today. How will you say thank you to your teachers this World Teacher’s Day? Share through the comments!